How much does it cost to travel to Liguria? How much money will you need in Liguria? €138 ($156) is the average daily price for traveling in Liguria. The average price of food for one day is €36 ($41). The average price of a hotel for a couple is €131 ($147). Additional pricing is in the table below. These average travel prices have been collected from other travelers to help you plan your own travel budget. The northwestern coast of Italy plunges into the sea as rugged mountains mix with blue water. Amongst this scenic landscape, small towns full of pastel colored houses cling to the cliffs above small harbors full of fishing boats and beachcombers. The capital is Genoa (or Genova), a city steeped in history with winding alleyways and world-class seafood. 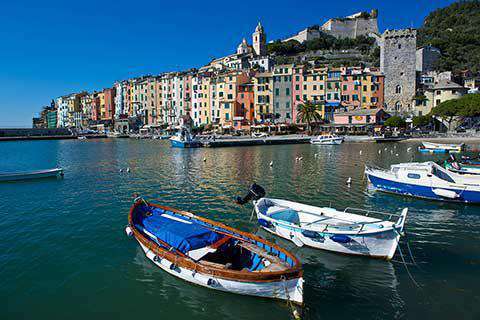 However, most visitors flock to nearby Portofino, one of the ritzier and more expensive, but extremely beautiful, Italian coastal cities. Here one can find large yachts parked along the shore next to rows of colorful buildings climbing the hills above the town. Long overlooked, but recently discovered by tourists the world over, are the five towns of Cinque Terre, a UNESCO World Heritage Site. The five towns (Vernazza is considered the most scenic, but you can't go wrong with any of them) are connected by hiking trails through the vineyards that spill down the mountains into the sea. Vehicles are not allowed, so streets are quaint and narrow. Train stations can be found in the middle of each town providing easier access than car or bus. The region is rich with other towns along the sea and inland as well. Consider all of your options before committing to one destination, as each town has a different personality, and often different prices.